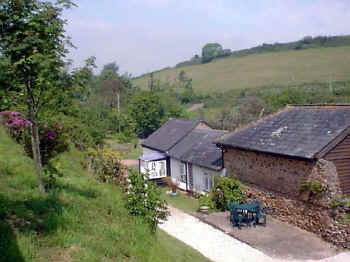 Set in the idyllic surroundings of the Otter Valley in the tranquil hamlet of Kersbrook, yet only 20 minutes from the M5 Motorway, “Stable Cottage” is a beautifully appointed spacious 2-bedroom single storey cottage, able to sleep up to 4 people. The unspoilt coastal town of Budleigh Salterton is less than a mile away, with its 3 miles of pebble beach and red sandstone cliffs. This region has recently been granted World Heritage status, listed as an “area of outstanding natural beauty” and is a paradise for all nature enthusiasts with its unusual wildlife and lovely coastal and river walks. There are many things to see and do in East Devon and Kersbrook is an ideal location to see as many or as few as you wish. Bicton Botanical gardens and the picturesque villages of East Budleigh and Otterton are just a 5-minute drive en-route towards the Regency town of Sidmouth, with its individual shops and unique atmosphere. Woodbury Common’s stunning views and home to Nigel Mansells Golf and Leisure complex is just 10 minutes drive away, and the cliff top East Devon Golf Course in Budleigh Salterton even less. Crealy Adventure Park and Exmouth’s Golden Sandy Beach are a short drive, and you can be enjoying the Cathedral City of Exeter or Dartmoor National Park in approx. half an hour. Children and Dogs welcome! Smoking is not allowed in the cottage, but there is a closed-in porch area off the lounge where guests are welcome to smoke. Large kitchen, airy split level lounge dining room with sofa, 1 x double bedroom and 1 x single bedroom with twin beds, bathroom with shower, own driveway with parking for several cars and private garden. The cottage features include a cooker, microwave, fridge, toaster, washing machine, iron & ironing board, telephone (honesty box), colour TV, video, CD player, garden furniture, towels, linen.